The Fishbowl activity is great for keeping a focused conversation, while having a large group of people. At any time, only a few people have a conversation (the fish in the fishbowl). 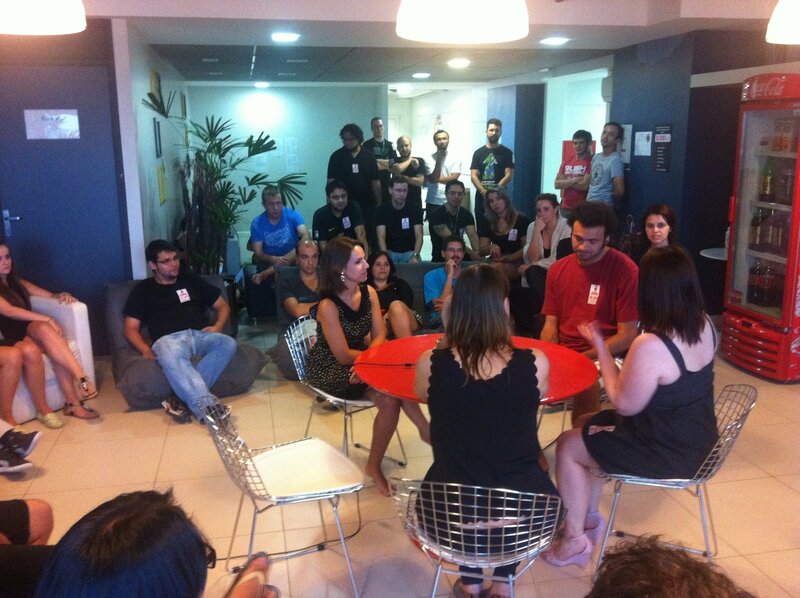 The remaining people are listeners (the ones watching the fishbowl). The caveat is that the listeners can join the discussion at any moment. 1. Place 5 chairs in an open area facing each other. The chairs shall be in the middle of the room, or around a round table. “Four people should sit on the chairs. They will start the conversation. One chair is to be kept empty all the time. It is available for whoever wants to join the conversation. When someone sits on the empty chair, someone else (typically the one either sitting longer or less involved in the current conversation) has to leave, vacating one chair. 3. Select a topic for the fishbowl conversation and get started. 4. Switch topics whenever appropriate. It can be time-boxed or changed whenever it runs out of conversation. We have seen this activity being used on conferences and large group conversations. I find it especially useful for very large groups conversations, with pre-selected topics.